Thank you for purchasing my game. If you have any questions, please feel free to contact me here. 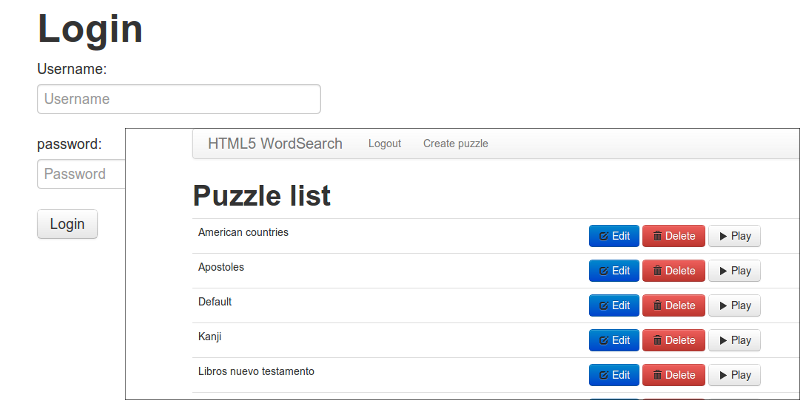 Now you can start creating puzzles, just go to the admin page http://<domain>/<install-dir>/admin/, after login, click on "create puzzle" and start adding words. Because the max size of the grid is 20 and the max number of words is size * 2 (see below), you must add at least 40 words to make the game work properly. The script choose random words of the supplied. Congratulations: You have HTML5 WordSearch installed. Note: you can change the default game options that are displayed in the admin panel, just edit the file admin/include/config.php (useful if for example you rarely use the english alphabet). Note: The script does not save the score, it just sends the info to the server so you can save it. time: Time required to complete the puzzle in ISO 8601 format (hh:mm:ss). Use these to rank the players. Note: You may want to change the div.modal rule at the Modal Window section. The buttons.css file specifies the appearance of the buttons. 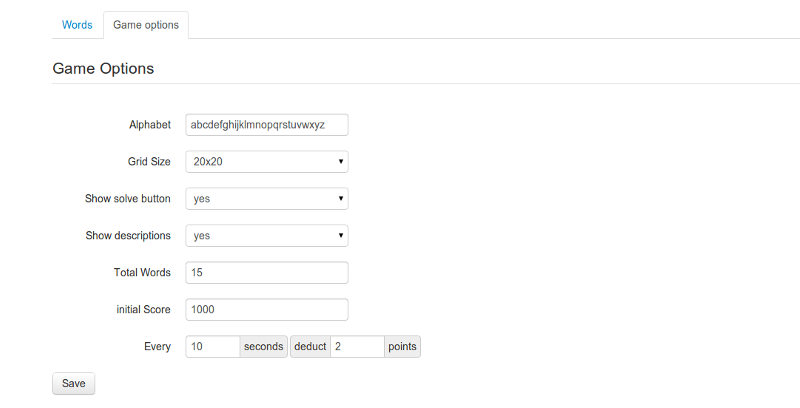 app.js: load and initialize the game. 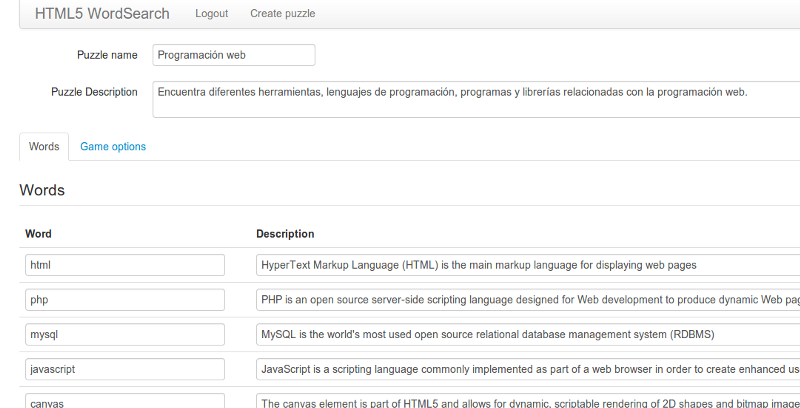 To initialize the app just create an instance of game.Soup() after the DOM is ready. You can also specify an object with options (see above). word.hint: Emitted when use the solve button. game.finish: Emitted when the game is finished (Duh), you receive the time and score. flashcanvas for compatibility with IE (MIT license).